Below are RotoBaller's Week 6 defense tiers and rankings, or which defenses to stream, start and target off the waiver wire for Week 6 of the NFL and fantasy football season. 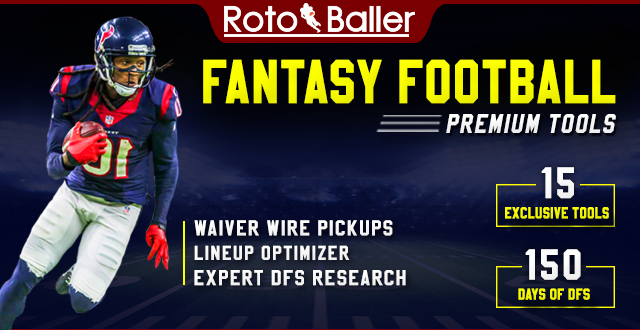 Our weekly tiered defense rankings are a guide to making waiver wire pickups to improve your lineups, and to decide which defenses to start, sit, target, avoid or stream for Week 6. Starting the right defense every week can be a difference-maker. Below we have broken out our defense rankings into tiers with analysis on each matchup. Some of these Week 6 defenses have good matchups and are not widely owned, representing fantasy scoring opportunities if they are available on your league's waiver wire for a Week 6 pickup or add. Good luck in Week 6 RotoBallers! The Chicago Fighting Khalil Macks are unstoppable, and Ryan Tannehill and the Dolphins sure don't have the firepower to slow this DST down. Sure hope you held on through the bye--this one could get ugly (pretty?). Bills pulled off a win against the Titans in Week 5, because if there's one thing you can count on Buffalo to do, it's win enough to ruin their draft position while still missing the playoffs. Josh Allen simply doesn't pose a threat, and with J.J. Watt and company applying ample pressure on the rookie and his beleaguered offensive line, the Texans should compete with the Bears for the top spot this week. Jeez, that Cowboys offense on Sunday night was hard to watch. Things won't get any better when Jalen Ramsey and company visit AT&T Stadium. Dak Prescott should be running for his life all day, and even Ezekiel Elliott can't do much on his own against this defensive unit. Fire 'em up and smile. The Baltimore Ravens have been stifling in 2018, allowing just over 13 points per game to opponents since their Thursday night drubbing at the hands of the Bengals in Week 2. They're currently tied for sixth in the NFL in sacks, and should be able to add to that total against Marcus Mariota in Week 6. Love the Ravens' floor this week, as Mariota is coming off a terrible, 129-yard performance against the hapless Bills. Expect the Ravens defense to make life miserable for him all afternoon. I had much higher hopes for the Eagles DST this season, but the results simply haven't been there so far. I expect that to change in Week 6 when they visit the New York Giants. Odell Beckham, Jr. is still a beast, but don't expect him to toss a 50-yard touchdown again. The Giants have allowed 16 sacks already and have eight giveaways on the young season, so there is plenty of potential for DST points here. When selecting a streaming DST, remember this slogan--"Eli Manning: the cure for what ails ya!" Following their Week 4 annihilation of the Bills, the Packers DST returned to Earth against the surging Lions offense, yielding 31 points and forcing zero turnovers. They should bounce back nicely this week against C.J. Beathard and the 49ers offense, which will also be without starting running back Matt Breida, who's on the shelf with an ankle sprain. Alfred Morris and C.J. Beathard are not a threat, plain and simple. You can fire up the Packers as a widely-available streaming option this week and feel pretty good about it. Which Raiders offense will show up, the one that hung 42 points on the Browns in regulation or the one that managed just 10 against the Chargers last week? My money is on the latter. Even if the offense does manage to put some points on the board, Derek Carr is competing for the league lead in interceptions (eight in five games) and can't manage any sort of consistency. The Seahawks could feast in this one, but I've got them in the third tier in my rankings based on their inability to manage much pressure and being on the road. If I change my mind on anything this week, it'll be to move the Seahawks up--the ball-hawking secondary could have a field day, even without Earl Thomas. The Titans disappointed on some levels last week, as they only managed one turnover and one sack against the atrocious Bills offense (I feel like I've mentioned them and their awfulness quite a bit already). However, this defense has allowed the ninth-fewest total yards of offense through five weeks, and they carry some upside against the Ravens who have allowed 12 sacks already this year. Temper your expectations though, as the ceiling is fairly low--the Ravens are a top-10 scoring offense, believe it or not. Speaking of that Ravens offense, it was just stifled by Denzel Ward and the Browns defense in Week 5. The Browns held their divisional rivals to just nine total points, and chipped in two sacks, a pick and a fumble recovery as well. I don't foresee them having as much luck against the Chargers, who will rely not on Philip Rivers, but rather Melvin Gordon and Austin Ekeler. The Browns are actually 22nd in the NFL against the run, and they're about to face off against the (arguably) best two-back tandem in the NFL. I'm fading the Browns this week. I'm not quite sure what to make of the Dolphins so far. Just when I was ready to write them off after they were torched by New England, they came out and held the previously red-hot (yes, that's an Andy Dalton joke) Bengals offense to just 15 points. They have some slight streaming potential this week, as they've had at least one interception in every game this season and they're home, but Mitch Trubisky and the Bears offense is coming off the bye and should be fresh with a game plan in-hand. My eyebrow is raised in intrigue, but I'm not feeling supremely confident that the Dolphins follow through on a good fantasy DST day without a defensive/special teams touchdown. The Bills defense MAY not be as bad as some of their performances indicate. The offense certainly isn't helping them when it comes to field position, and that's why I'm extremely unlikely to move them out of the fourth or fifth tier any time soon. However, they DO have at least two sacks in every game, and they're tied for seventh in the NFL in takeaways (9). I don't think they can completely contain Deshaun Watson and DeAndre Hopkins, but don't be surprised if this is another ugly, low-scoring affair like last week's Bills/Titans game was.